This article could only be made with the help of Michael Jung, Paul Geilenkirchen, Jens Bech (my father), Jacques Crul director of the Blegny Mine. 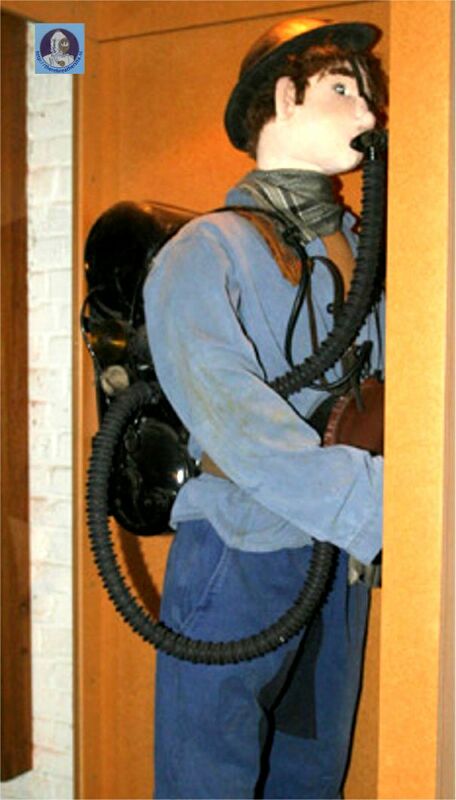 Many times I read about the man who invented the first rebreather. 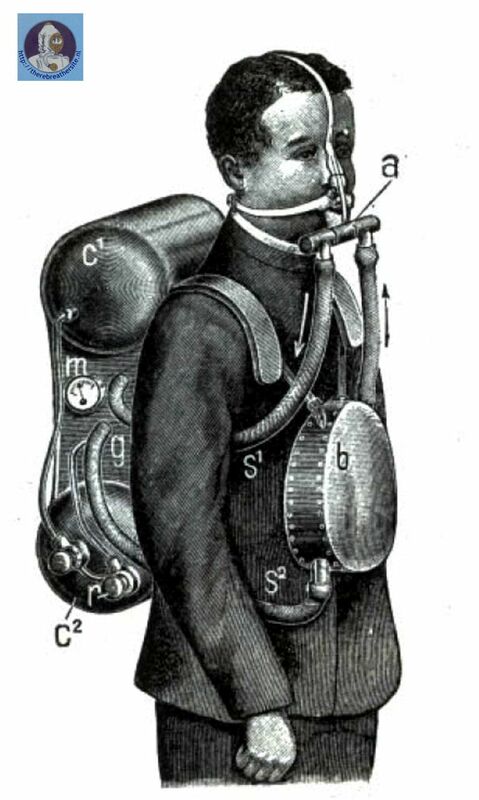 Most diving books write that the first rebreather was designed and patented by Mr. Fleuss in cooperation with Siebe Gorman. 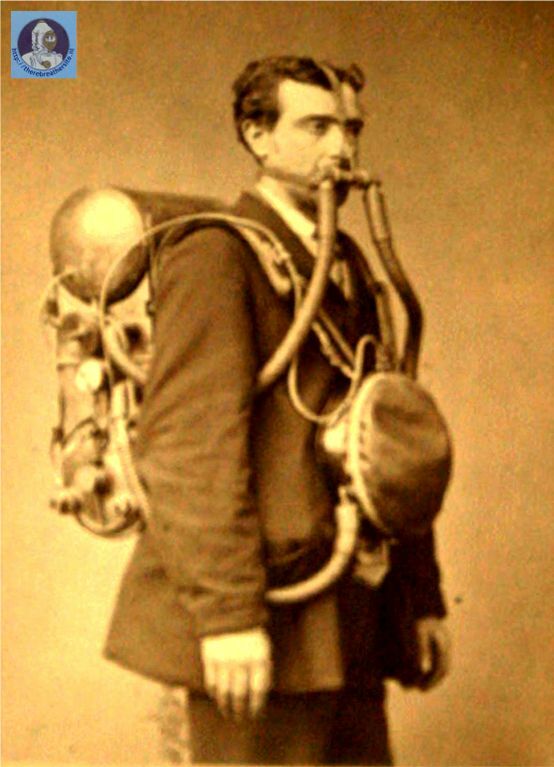 In fact Mr. Fleuss patented the first rebreather, but this man Professor Theodore Schwann invented the first unit. A very common mistake that can be found in many books is that he was a Belgium scientist. He was not. Theodore Schwann was born in Neuss in 1810 and is German. The invention was done in Belgium when he was working as a professor in Liége. This page offers all the materials I could find about this first rebreather, and the scientist Schwann. There are some pages that still need to be translated. I would be very pleased if someone is able to translate the French text in English. 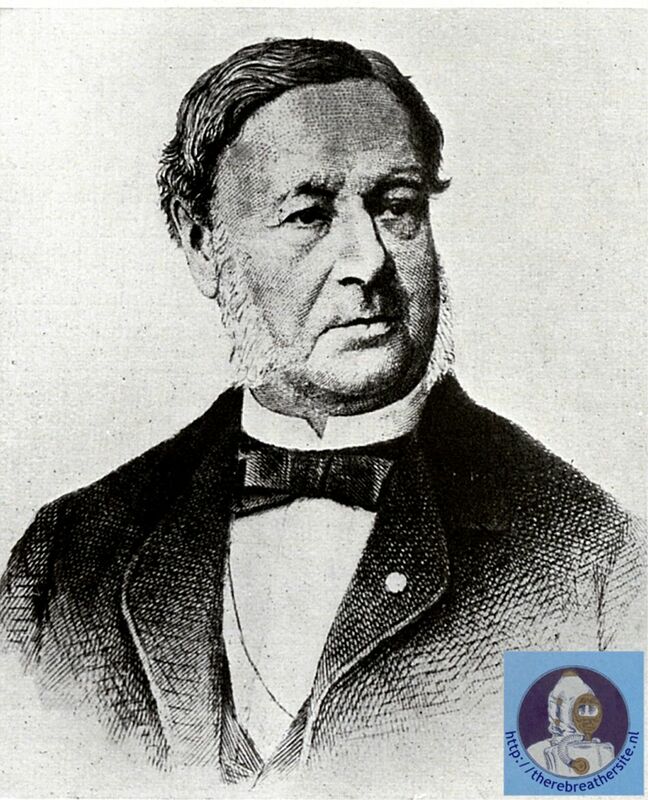 Theodore Schwann was a German physiologist who was born at Neuss in Germany on the 7th of December 1810. Schwann studied in Cologne and afterwards at Bonn, where he met Johannes Müller, in whose physiological experiments he soon came to assist. He next went to Würzburg to continue his medical studies, and from there to Berlin to graduate in 1834. Here he met Müller again, who had been meanwhile moved to Berlin, and who finally persuaded him to enter on a scientific career and appointed him assistant at the anatomical museum. Schwann in 1838 was called to the chair of anatomy at the Roman Catholic university of Louvain, where he remained nine years. In 1847 he went as professor to Liége, where he remained until his death on the 11th of January 1882. He was of a peculiarly gentle and amiable character, and remained a devout Catholic throughout his life. It was during the four years spent under the influence of Müller at Berlin that all Schwann's really valuable work was done. Müller was at this time preparing his great book on physiology, and Schwann assisted him in the experimental work required. His attention being thus directed to the nervous and muscular tissues, besides making such histological discoveries as that of the envelope of the nerve-fibres which now bears his name, he initiated those researches in muscular contractility since so elaborately worked out by Du Bois Reymond and others. He was thus the first of Müller's pupils who broke with the traditional vitalism and worked towards a physico-chemical explanation of life. Müller also directed his attention to the process of digestion, which Schwann showed to depend essentially on the presence of a ferment called by him pepsin. Schwann also examined the question of spontaneous generation, which he greatly aided to disprove, and in the course of his experiments discovered the organic nature of yeast. In fact the whole germ theory of Louis Pasteur, as well as its antiseptic applications by Joseph Lister, is traceable to his influence. Once when he was dining with Schleiden in 1837, the conversation turned on the nuclei of vegetable cells. Schwann remembered having seen similar structures in the cells of the notochord (as had been shown by Müller) and instantly realized the importance of connecting the two phenomena. The resemblance was confirmed without delay by both observers, and the results soon appeared in his famous Microscopic Investigations on the Accordance in the Structure and Growth of Plants and Animals (Berlin, 1839; translated to English by the Sydenham Society, 1847). The cell theory was thus definitely constituted. In the course of his verifications of the cell theory, in which he traversed the whole field of histology, he proved the cellular origin and development of the most highly differentiated tissues, nails, feathers, enamels, etc. His generalization became the foundation of modern histology, and in the hands of Rudolf Virchow (whose cellular pathology was an inevitable deduction from Schwann) afforded the means of placing modern pathology on a truly scientific basis. This part of his biography describes his scientific career only. 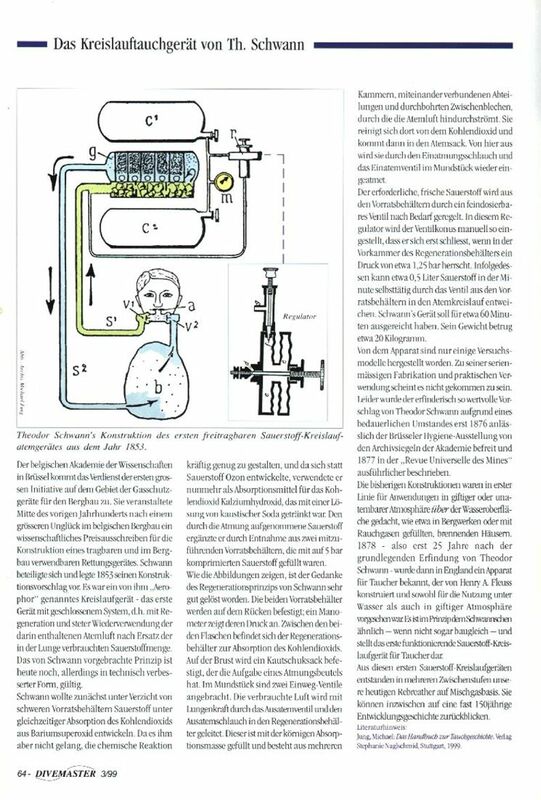 The M. Jung article is more detailed about his work regarding the development of the first rebreather. Thanks to the university of Liege I have been able to show these documents. Now Rob Bakker has translated them! I am very grateful to him since that must have been a difficult job. Now we have access to these really unique documents! By Th. 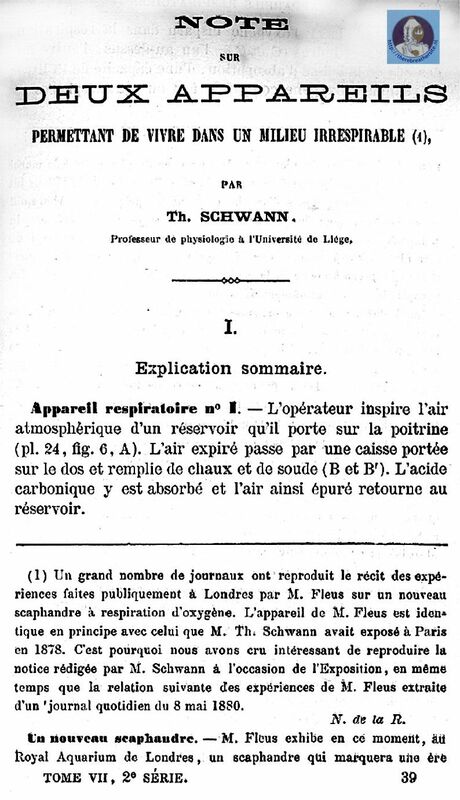 Schwann professor of physiology at the University of Liège. Breathing apparatus No. 1 – The operator inspires atmospherical air from a reservoir that he carries on his belly. (Pg 24 fig 6,A) The expired air passes through a box carried on the back and filled with chalk and soda (B and B’). The carbonic acid is absorbed here and the in this way purified air returns to the reservoir. 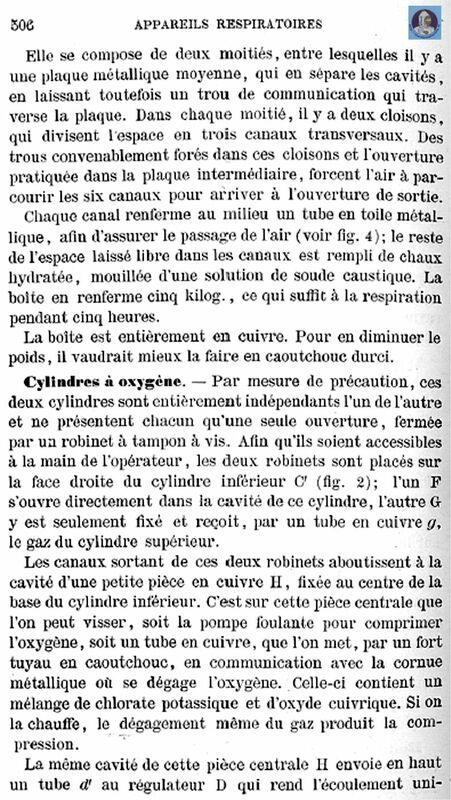 (1) A great number of newspapers have reproduced the report, publicized in London, by Mr. Fleus on the experiences with a new piece of oxygen breathing diving equipment. The apparatus of Mr. Fleus is identical in its principle to that Mr. Th. 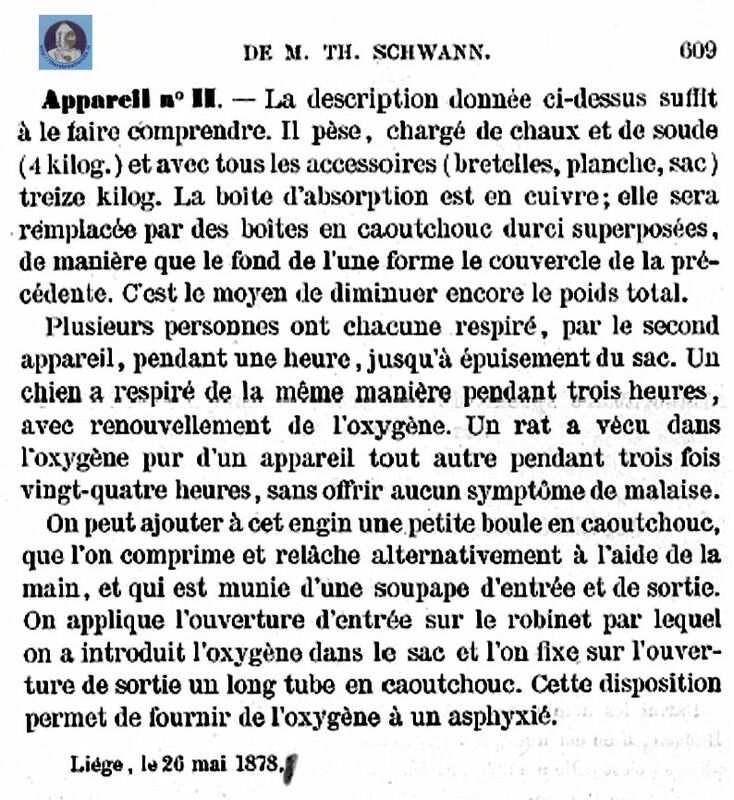 Schwann exhibited in Paris in 1878, That is why we believe it is interesting to reproduce the note edited by Mr. Schwann on the occasion of the exhibition and at the same time the report on the experiences of Mr. Fleus copied from a newspaper of May 8th, 1880. A new diving apparatus. – Mr. Fleus exhibits at this moment (in the Royal Aquarium in London) a diving apparatus that marks a new era in the art of the diver. To replace the oxygen that disappears in the breathing, there are two cylinders (C and C’) one above and one below the absorption box, with a capacity of fifteen liters and filled with compressed oxygen of 4 to 6 atmospheres. Up to now the aforementioned was at the mercy of the men at the line and the air pump; the invention of Mr. Fleus gives him freedom to act. In the future it is his own composition he needs to depend on to safeguard his means of breathing, as the air pump is now completely superfluous. As compensation, he is no longer subjected to death by asphyxiation caused by an accident to the airline or negligence of the men at the pumps. The new invention is duly patented. Last Monday Mr. Fleus stayed under water for two hours and seven minutes without any communication with the surface. The spectators amused themselves with throwing him messages written on stones. After having read them he took his pencil and responded in writing, remaining under water all the time. The helmet that he wore was of normal proportions and form. Exiting from his bath Mr. Fleus did explain in a few words the principles on which his invention was based. It is that simple that it is amazing that nobody has thought of it before him. Two words in advance: atmospherical air is composed of a certain quantity of oxygen and approximately four times as much nitrogen. Apart of the oxygen transforms by breathing to carbonic acid: as the required amount of oxygen is hereby destroyed the air is no longer fit for breathing. On the other hand if we replace the amount of oxygen absorbed by the same amount of the same gas, air, first refreshed, then it can be breathed again. 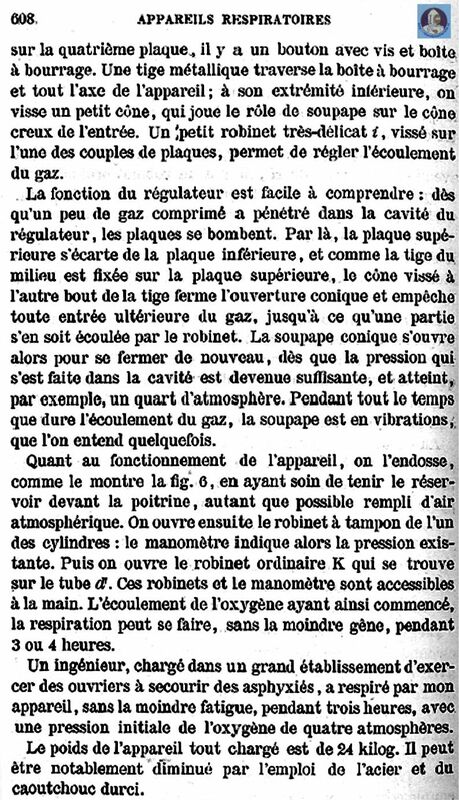 Taking these facts as a base Mr. Fleus said that if he could take a certain amount of compressed oxygen with him he would be able to breath freely, releasing a continuous flow of this gas into the air contained in his diving suit. 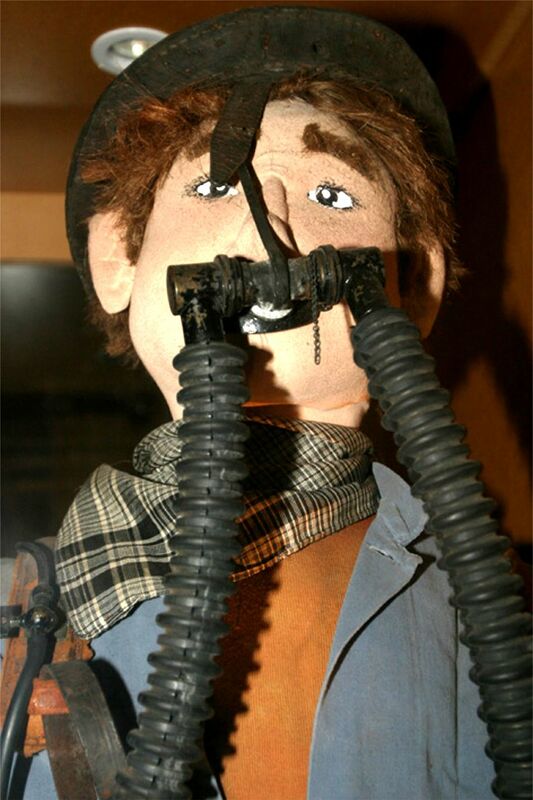 The apparatus consists foremost out of a small container of leather equipped with entry and exit valves that are connected to the nose and mouth of the diver, which are kept in place by elastic bands. Below, in the helmet, the oxygen reservoir is found, where it is stored under considerable pressure. 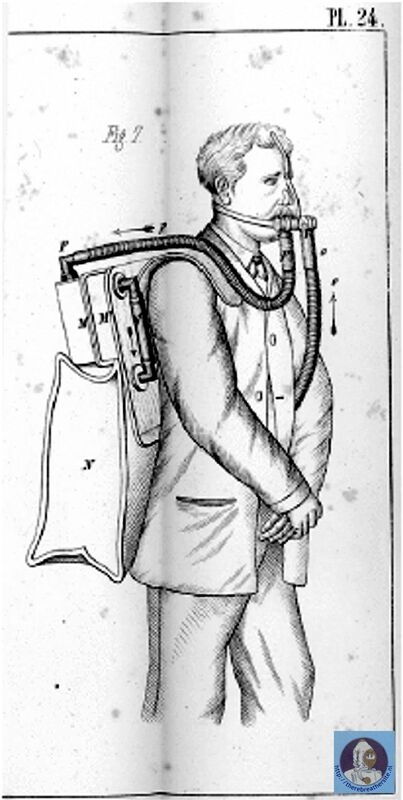 The remaining part of the apparatus consists of two purifiers, one placed in front of the diver and one behind him, below the suit. The gas releases by means of a regulator of a new construction (fig. 1 ,2 and 3,D) that creates a uniform release despite a continuous reduction of the pressure. The oxygen is conducted from there by tube d into the exhale tube and passes, together with the expired air, through the absorption box into the reservoir hanging in front of the belly. The air expired by the respiration passes through the exhale valve by means of a flexible tube that is attached to it and that communicates with the purifier placed in front of the diver. The purifier consists of a metal plated chamber having a double perforated bottom: it is divided vertically from top to bottom in two compartments which contain each a rubber sponge saturated in caustic alkali solution. The expired air enters at the top of one of the two compartments, goes through it, passes through the double bottom and returns through the second compartment; it passes then through a tube to the purifier placed behind the diver, which is constructed in the same manner as the first one. Passing through these two purifiers, the air is cleaned of all bad elements; however to make it fit for breathing it needs to be revived. For this, it enters the inside of the helmet and circulates around the divers head where it encounters a small pocket of pure oxygen that comes from the main reservoir to the diver demand and mixes with it. The oxygen enclosed in the helmet to an initial pressure of approximately 200 pounds is released through a small valve placed on the outside of the container. The space reserved for the provision of oxygen can contain four cubic feet of oxygen, which suffices for four hours; that is the longest time that, under normal circumstances, one can ask a diver to stay under water. The purifiers have the same proportions, in this way one can maintain their activity over an equal period of time. We have forgotten to mention that the diver, when he is not equipped with hoses nor air pumps, communicates with the surface by means of a signaling line. This invention will, without any doubt, be very useful in numerous cases, for instance in the docks where work of divers is often required. The apparatus can be used, depending on the amount of compression of the oxygen, for a duration of 2, 3 or 4 hours. A trained person has breathed the apparatus for three hours consecutively, while the oxygen was compressed to 4 atmospheres. Breathing apparatus No. II. – Experiments on animals and with humans have proven to me that 100% oxygen can be breathed without any inconveniences. Thanks to that the apparatus, that allows to live in an irrespirable environment, reduces to an absorption box (fig. 4 and 7, MM’) filled with chalk, impregnated with soda and a rubber bag (fig. 7, N) with a capacity of 30 liters. Both are carried on the back. While the bag is filled with oxygen, the operator inhales part of it directly through tube o. The exhale gas passes through tube p and the absorption box, where it losses its carbonic acid and returns pure into the bag by tube q. The absorption box (look at the makeup, fig. 4) suffices for breathing for four hours; 30 liters of oxygen suffice for one hour. However one can carry by hand a steel cylinder with a capacity of 15 liters, weighing, with accessories, 3.5 kilograms; enclosing oxygen compressed to 4 atmospheres or more if one wants. (The compression takes place effortlessly by the release of the gas when one heats a mixture of potassium chlorate and copper oxide in a strong metal container.) One can in this way refill the bag every hour and stay in an irrespirable atmosphere for 3 to 4 hours. If one takes care to keep the cylinder filled with compressed oxygen, the apparatus is always ready for use. It can be used, amongst others, for medical purposes, if one wants a sick person to breath oxygen. 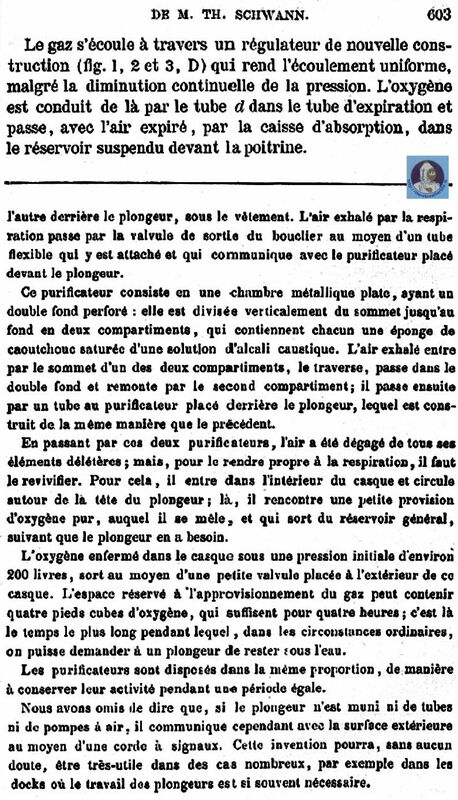 The two apparatuses are on the method introduced into science by Regnault and Reiset, the method consists of breathing the same air continuously except for the absorption of carbonic acid and replacing the oxygen that disappears during breathing. 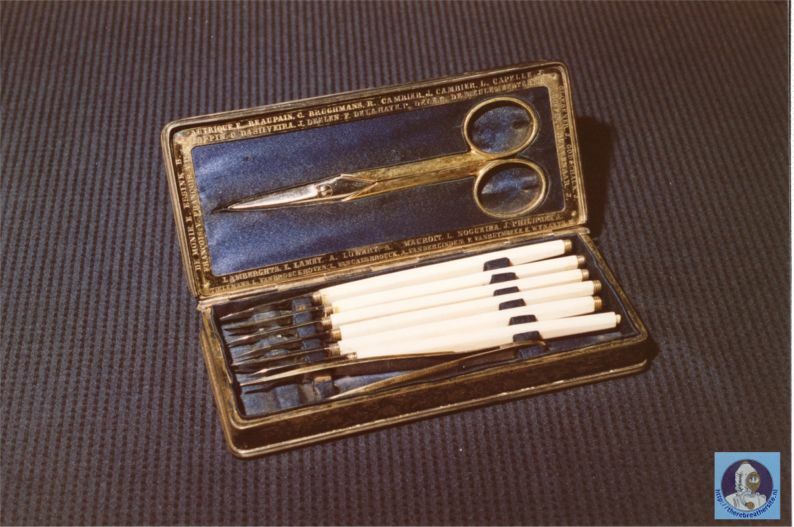 The description of the basic form of my first apparatus has been deposited, in a closed envelope, with the Academy of Science in Brussels in 1854, following that the Society put the problem up for contest, on which no reply was received. Apparatus No.1. – Mouthpiece (fig.5).- After many trials I found that the best way of fixing the tubes to the mouth consisted of a piece of metal, concave on the outside, that rests, with is sides, on the lips. To the outside face a metal plate is soldered squarely that sticks between the lips just to the teeth. It circumvents an opening in the form of an open mouth. This plate, on which the red part of the lips press closes off the mouth very well, even for very bearded persons; it does not provoke salivation and does not allow any expired air to enter into the intermediate space; as there is between a mask and the person. At the front of the piece a short transversal tube is soldered that carries the valves: one for inhalation and the other for exhalation. The nose is closed by a separate elastic pin, which is utilized at the moment the air becomes un-breathable. Absorption box BB’ (fig 1, 2 and 6) – This occupies the space between the two cylinders in such a way that the upper and lower sides fit to these. It is compose of two parts, between which is halfway a metal plate that separates two spaces leaving a communicating hole over the length of the plate. In each part there are two walls that divide the space into three transverse channels. The holes that have conveniently been drilled in the walls and the practical opening in the intermediate plate force the air to travel the six channels before arriving at the exit opening. Each channel encloses in the middle a tube of wire-cloth to ensure the passage of air (see fig.4); the remaining space left over in the channels is filled with hydrated lime wetted with a solution of caustic-soda. The box contains 5 kilograms, sufficient for breathing for five hours. The box is made completely from copper. To reduce the weight, it would be better to make it out of hardened rubber. Oxygen cylinders. – As a precaution these two cylinders are completely independent of each other, having each just one opening, closed with a valve with a screw closure. To make them accessible to the hand of the operator the two valves are place on the face of the right side of the lower cylinder C’ (fig.2), one (F) opens directly to the cylinder, the other (G) is just mounted there and receives by a copper tube (g) the gas from the upper cylinder. The channels leaving these two valves end in a cavity of a small piece of copper (II) mounted in the center of the base of the lower cylinder. It is in this central part that one can screw either the pump to compress the oxygen or a copper tube which is connected through a strong rubber tube to a metal retort where the oxygen is extricated. It contains a mixture of potassium chlorate and copper oxide. If it is heated the extrication of the gas produces the compression by itself. flow and from there the gas arrives through a rubber tube (d) in the tube (b) where the exhaled air passes through. The small valve of the regulator (i) allows to regulate the amount of oxygen that needs to flow very precisely, that is approximately half a liter per minute. In the tube (d) connecting the regulator with the central part (H) there is a normal valve (K), which is coarsened carefully, so that the knob is usable by hand. It is opened when you want to breathe from the apparatus. The pressure gauge is placed in such a way that one can always touch a lengthened pointer with your hand. This moves behind a circle-segment of buttons that indicates the pressure in atmospheres. The other branch is a long tube of lead fixed to the right iron carrying strap. At the right shoulder the tubes ends in a small valve. A small rubber tube connects this valve with the reservoir (A) that is worn on the belly and from which one breathes in. The ‘baby-bottle’ first serves to route gas to the reservoir if there is not enough, then in maintaining the breathing when something is wrong with the regulator and finally to provide oxygen to a suffocated person, where the rubber tube is put in his mouth. on the fourth plate there is a knob with a screw and blanking plug. A metal valve stem travels through the blanking plug in the axis of the device; at its inner end one sees a small cone that pays the role of a valve on the hollow entrance. A tiny delicate valve (i) screwed on one the set of plates allows to regulate the gas flow. The operation of the regulator is easy to understand: once a bit of compressed gas has entered the cavity of the regulator the plates bulge. This causes the upper plate to move away from the lower and as the valve stem is fixed to the upper plate the cone screwed to the other end of the stem closes the conical opening and stops the inflow of gas until a part has flowed from the valve. The valves opens to be closed again when the pressure formed in the cavity is enough and reaches, for instance, a quarter atmosphere. During the flow of gas the valve vibrates, which can be heard sometimes. 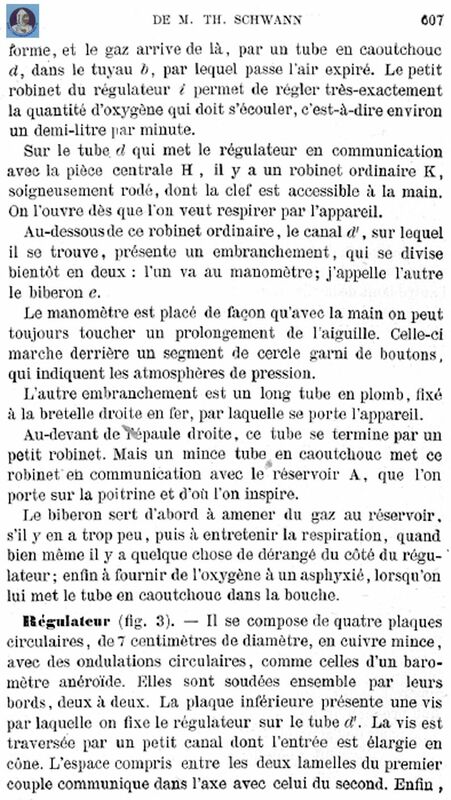 With respect to the functioning of the apparatus when it is worn like it is shown in fig.6, care should be taken that the reservoir is kept in front of the belly, filled as much as possible with atmospherical air. Then one opens the valves of one of the cylinders and the pressure gage indicates the pressure available. Next ordinary valve (K) that is in tube (d’) is opened. These valves and the pressure gauge are operable by hand. As the oxygen flow now has started, respiration can start without impediment for a duration of 3 to 4 hours. An engineer, from a large company, charged with training workers to save asphyxiated persons, has breathed from my apparatus, without fatigue, for three hours, with an initial oxygen pressure of four atmospheres. 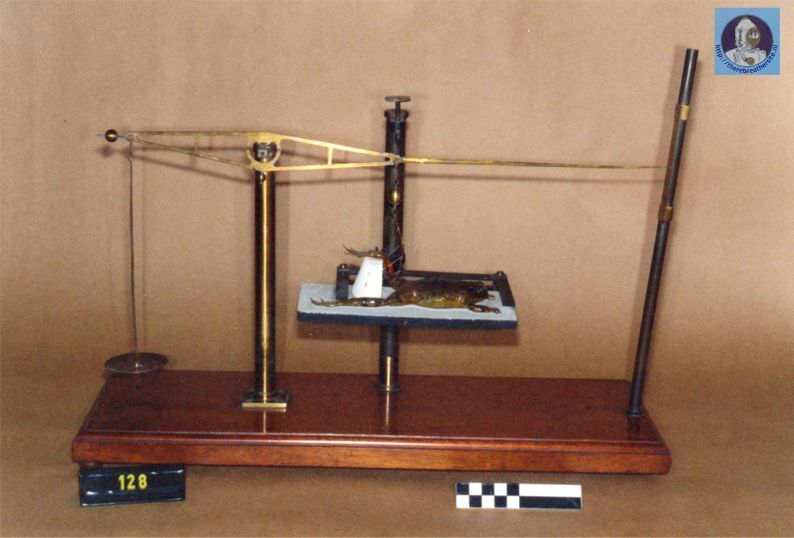 The weight of the complete charged apparatus is 24 kilograms. This could be seriously reduced by the use of steel and hardened rubber. Apparatus No II. – The description given below suffices to understand it. It weighs, filled with lime and soda (4 kilograms) and all the accessories (braces, plank, bag) 30 kilograms. The absorption box is made from copper; it will be replaced by boxes made from hardened rubber on top of each other, in such a way that the bottom of one forms the cover of the preceding one. This is the way to reduce the weight even further. Several persons have each breathed the second apparatus for one hour, just until the bag was empty. A dog has even, in the same way, during three hours, with refilling oxygen. A rat has lived in pure oxygen in a different apparatus for three times twenty-four hours, without showing any sign of illness. One could add to this machine a little rubber ball that can be squeezed and released alternatively, equipped with an entry and an exit valve. The inlet opening is connected to the valve that lets oxygen into the bag and the outlet opening is connected to a long rubber tube. This set-up allows supplying an asphyxiated with oxygen. Rob, thanks for the fine job! Michael Jung has been publishing a very nice article about Schwann in 1999. Here you find these two pages published in "Divemaster"
Here is the English translation of the article by M. Jung. I would like to thank Rita Oosterbaan for this great job! Thanks Rita! The article has been translated with the lind permission of the author! The technique of the recycling breathing apparatuses is, as is the phenomenon of chemical regeneration of air, very old and initially originated from the general breathing protection technique. Although only the apparatuses of the last 100 of years are really fully operational, history takes us much further back and the use of the systems during the war increased considerably. 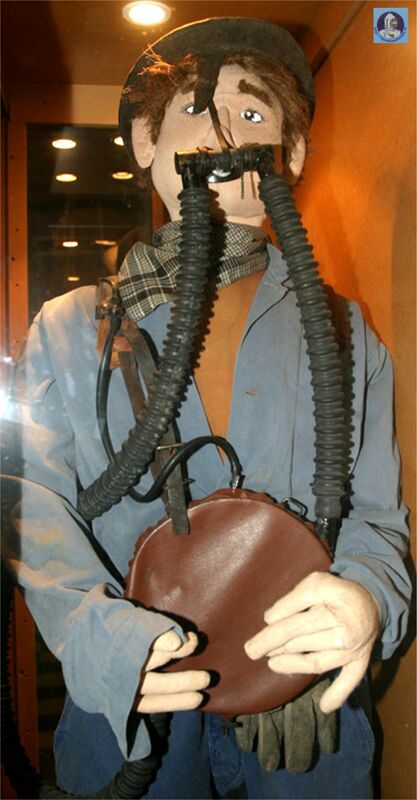 The requirements of the fire brigade, mineworkers and coke installations were the real pulses for the construction of the breathing protection systems. The English botanist Stephan Hales invented the first breathing circuit and air regeneration apparatus around 1726. A wooden mouthpiece with an inhale and exhale valve contained a windbag with separating walls of flannel. The flannel had been impregnated with sea salt and wine-stone and had to absorb "acid air from the lungs". Hales could breathe almost 9 minutes from this primitive apparatus. In 1774, Cavallo suggested to take an oxygen stock along in bags which could be inhaled in case of "spoiled matter". The exhalation also needed to take place into the bag, where the dirty air (carbon dioxide) was absorbed by the lime already in the bag. Another interesting idea came from Jan Ingenhousz. 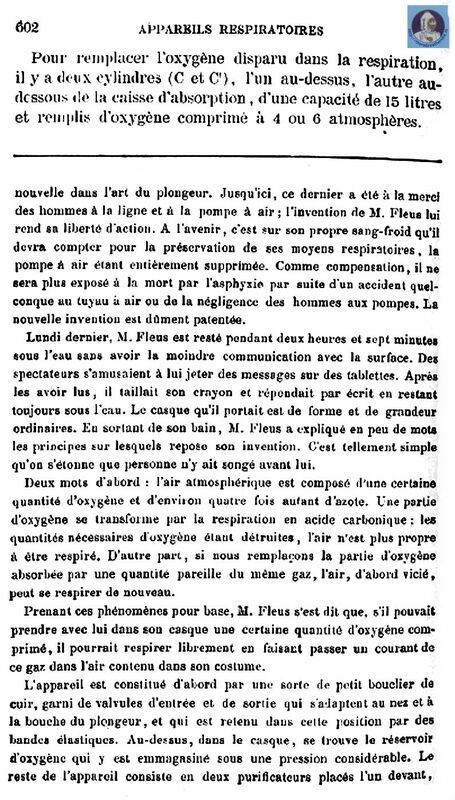 In 1779, the physicist introduced his invention of air regeneration to the Royal society: air had to be exhaled into a bottle with lime water, so that the carbon dioxide was bound by lime water and air could be inhaled again. The basic principle of regeneration of breathing air - to flow exhaled air through a chemical active fixed substance or a fluid to absorb the carbon dioxide - was maintained by more recent manufactures. Other inventors in this area were Robert Menzies (1790), Voigt (1795) Pilatre de Rozier (1783), known as the first balloonist, and Francois H.S.de l'Aulanye (1786). Even Alexander von Humbold tested his efforts between 1795 and 1799 by regenerating breathing air in a simple construction of a closed circuit system. 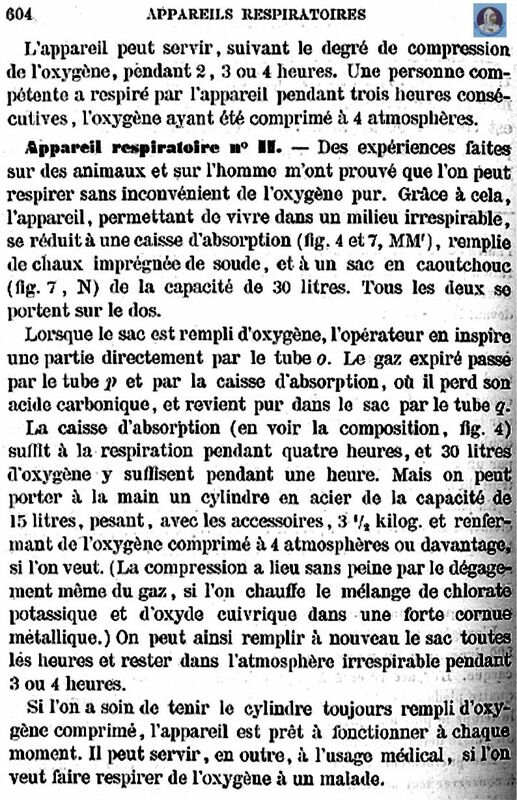 However the first portable recycling oxygen apparatus that was really successful was build in 1853 by the German naturalist, physician and physiologist, Professor Dr.Theodoor Schwann. Theodoor Schwann was born in 1810 on December 7 in Neuss (near Keulen) where his father had a bookshop. He died in 1882 on January 11 in Keulen. He was the fourth son of a big family - he had 12 brothers and sisters. After finishing primary and grammar school in Neuss and Keulen he studied medical science at the university in Bonn, Würstenburg and Berlijn. In 1839 he was appointed in his first academic job at the University of Leuven after working as an assistant at the anatomical museum in Berlin for 5 years. In 1848, he went to the Belgian University in Luik where he was appointed as a professor in the anatomy. There he worked until 1880. Even after ending his post, Schwann remained in Luik and only spent his holiday with his family who lived in Neuss, Keulen and Dusseldorf. After given lectures at the university, he intensively occupied himself with the question of the physiology of breathing and carried out a large number of direction indicating experiments. In 1837, after a number of experiments, he collected conclusive evidence for the fact that yeast is a living organism and that fermentation takes place by its life supporting activities. The first great initiatives were taken in the mining industry by the Belgian academy of Sciences. In the middle of the nineteenth century, after a mining disaster in Belgian, a scientific quiz was organized. People were challenged to construct a stretcher and a rescue system that could be set in during mining accidents. Schwann handed in his construction design in 1853. It was the design of a recycling system, called “Aerophor"; it was the first closed system in which breathing air continually was recycled and made ready for use again, after the metabolized oxygen had been replaced. The basic principle invented by Schwann is still, though nowadays in advanced technical form, accepted. First of all, Schwann wanted to absorb the Carbon Dioxide and produce Oxygen at the same time using heavy oxygen tanks with Bariumsuperoxide. As he did not succeed in creating a strong enough chemical reaction he started using absorption material. The absorption material was soaked by caustic Calciumhydroxide to react with the CO2. The oxygen that was metabolized was supplied by two carried cylinders filled with oxygen of 5 bar. As you can see from the pictures the thought of the recycling principle was very well solved by Schwann. Both cylinders are fastened at the back: the pressure is displayed by a pressure gauge. The CO2 absorption canister is located between both cylinders. In front a rubber bag used as a breathing bag (counterlung) is fastened on the belly. The mouthpiece contains two one-way valves. By the strengths of the lungs the metabolized air is expired through the valves and expiration hose into the canister. The canister is filled with granular material. The expired air flows through the several connected compartments and the metal perforate partitions of the canister. In here the air is ‘cleaned’ and flows into the breathing bag from which the air is inhaled again by the inspiration hose and valve in the mouthpiece. The needed fresh oxygen is added on demand from the oxygen cylinder by a small nozzle. By this regulator the valve is adjusted by hand in such a way that the valve closes only after the pressure in the first compartment of the canister has reached 1,25 bar! Therefore about 0,5 litres of oxygen per minute can flow out of the cylinders by itself. 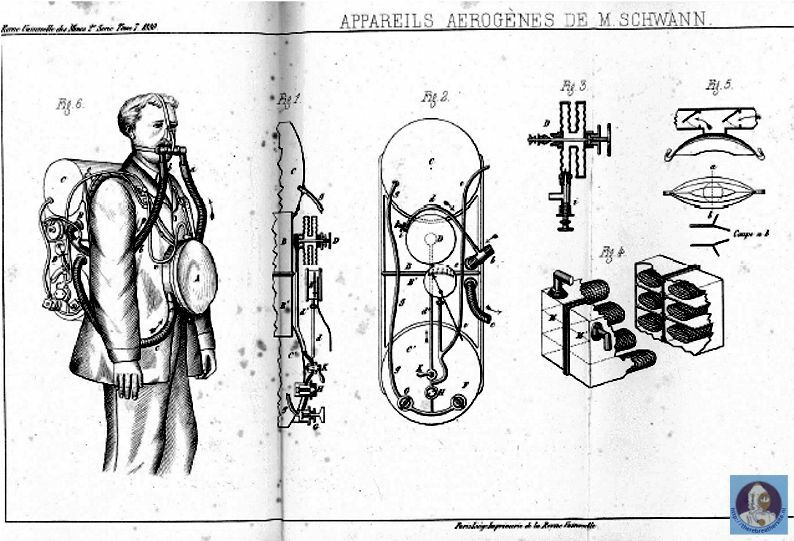 The apparatus from Schwann could supply breathable gas for about 60 minutes. The weight of the unit is about 20 kilograms. From this system only a few test models are made. The system has never made it to get produced in series and has never been used that much. A tragic incident that took place in 1876 was the reason that the ingenious and valuable design of Th. Schwann was lifted from the archives of the academy after all and published at the "Brussels hygiene - exhibition". 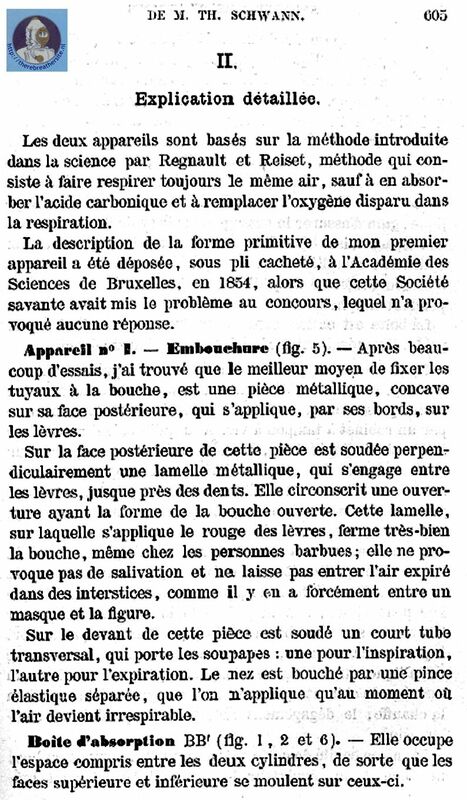 The model was explained in more detail in 1877 in the " Revue universelles des Mines". The constructions used so far were mainly designed for usage in caustic or un-breathable atmospheres at the surface, for instance in mines or burning buildings. Only after 25 years, in 1878, after the basic invention of Th. 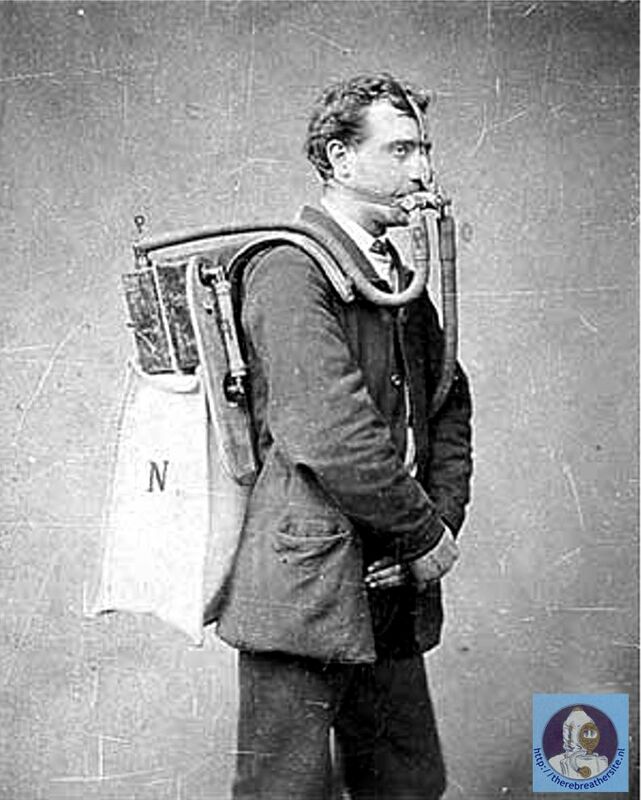 Schwann, in Britain an apparatus was presented for the diving market. The system was constructed by Henry A. Fleuss and was made for use as well for underwater as for caustic atmospheres. The principle of the system is the same although the construction differs. 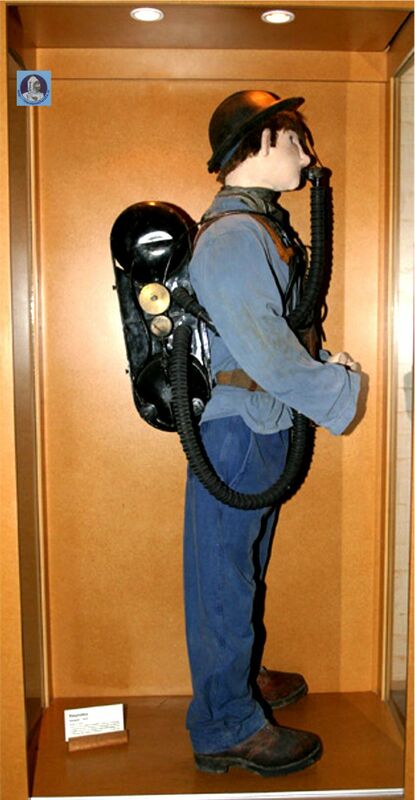 Fleuss is the designer of the first functioning oxygen rebreather apparatus used by divers. After several phases in the designing process and different types of rebreathers these first oxygen rebreathers have been the basic model for nowadays rebreather systems. 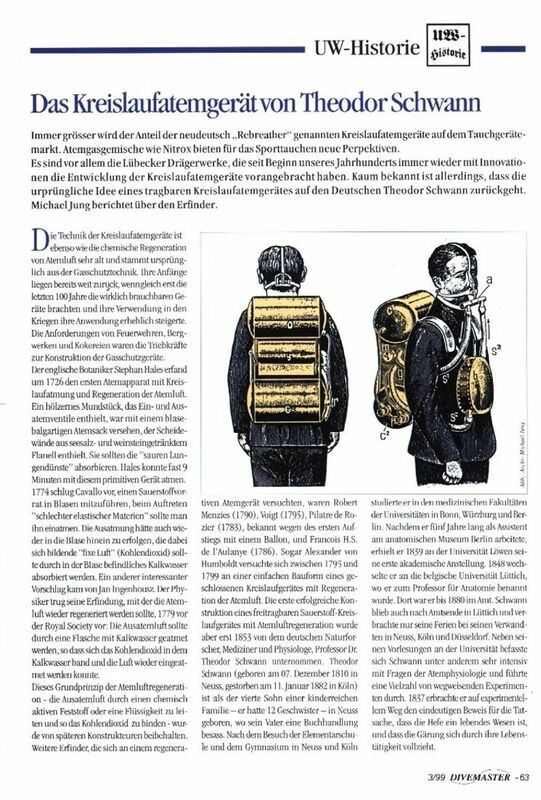 In the meanwhile we can review at a history of designing rebreathers which is almost 150 years old. 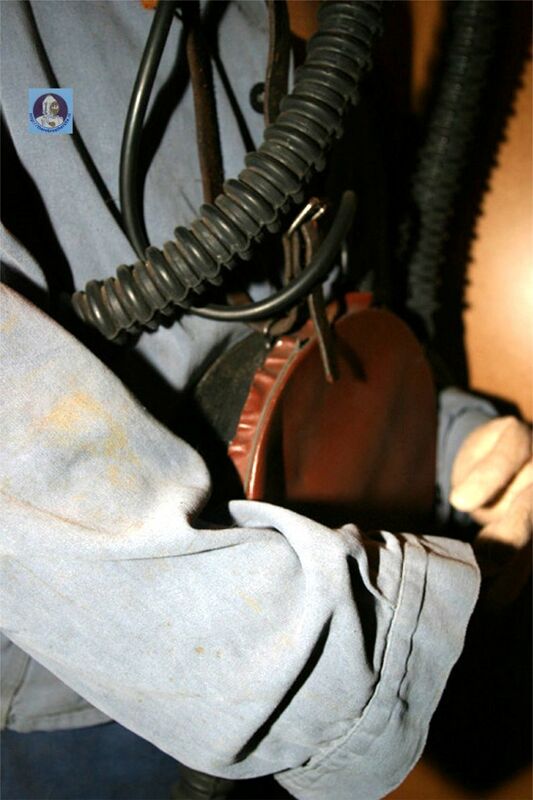 Next pictures where made by Paul Geilenkirchen in the Blegny Mine museum (Belgium) . The photos show one of the three (?) Schwann units with modifications to hoses and breathing bag. Het aandeel van nu "Rebreathers" genoemde toestellen, oorspronkelijk kringlooptoestellen genoemd, wordt steeds groter op de duikmarkt. Ademgas mengsels zoals Nitrox bieden voor het sportduiken nieuwe perspektieven. Het zijn vooral de "Drägerwerke" uit Lubeck die sedert het begin van onze eeuw telkens weer met innovaties in de ontwikkeling van kringlooptoestellen op de voorgrond traden. Het is echter nauwlijks bekend, dat het oorspronkelijke idee van een draagbaar kringloopademtoestel komt van de Duitser Theodoor (Theodore, M, Theo =alternative benamingen) Schwann. Michael Jung van het Hans Hass instituut doet verslag. Vertaald werk uit een artikel van 1999 uit Divemaster. De techniek van de kringlooptoestellen is net zoals de chemische regeneratie van ademlucht zeer oud en komt oorspronkelijk uit de gasbescherm techniek (adembescherming). Men begon hiermee al heel lang geleden, hoewel de werkelijk bruikbare toestellen van de laatste 100 jaar zijn, en het gebruik ervan in de oorlog aanzienlijk toenam. De eisen van de brandweer, mijnen en cokesinstallaties waren de impulsen voor de constructie van de adembeschermings toestellen. De Engelse botanicus Stephan Hales vond rond 1726 het eerste kringloop ademhaling en regeneratie toestel uit. Een houten mondstuk waarin het in- en uitadem ventiel zat, was van een adembalg voorzien, die scheidingswanden van flanel had. Deze flanel was doordrenkt met zeezout en wijnsteen. Dit flanel moest de "zure longlucht" absorberen. Hales kan bijna 9 minuten met dit primitieve apparaat ademen. In 1774 stelde Cavallo voor een zuurstofvoorraad mee te nemen in zakken, zodat men bij het optreden van "bedorven materie" die kon inademen. De uitademing moest ook weer in de zak gebeuren, terwijl de zich daarbij onstane vieze lucht (kooldioxide) door het zich in die zak bevindende kalkwater geabsorbeerd werd. Een ander interessant voorstel kwam van Jan Ingenhousz. De fysicus stelde zijn uitvinding, waarbij de ademlucht weer geregenereerd zou worden, in 1779 voor aan de Royal Society: de uitgeademde lucht moest door een fles met kalkwater geademd worden, zodat het kooldioxide door het kalkwater gebonden werd en de lucht weer ingeademd kon worden. Het grondprincipe van de ademhalingsgeneratie - de uitgeademde lucht door een chemisch aktieve vaste stof of een vloeistof leiden en aldus de kooldioxide te binden - werd door de latere constructeurs gehandhaafd. Andere uitvinders, die zich aan de regeneratie van een ademtoestel waagden, waren Robert Menzies (1790), Voigt (1795) Pilatre de Rozier (1783), bekend wegens het eerste opstijgen met een ballon, en Francois H.S.de l'Aulanye (1786). Zelfs Alexander von Humbold beproefde zijn krachten tussen 1795 en 1799 op een eenvoudige bouwvorm van een gesloten kringlooptoestel met regeneratie van ademlucht. De eerste succesvolle constructie van een vrij draagbaar zuurstof kringloop apparaat werd echter pas in 1853 door de Duitse natuuronderzoeker, arts en fysioloog, Professor Dr.Theodoor Schwann ondernomen. Theodoor Schwann (geboren op 7 december 1810 in Neuss (nabij Keulen) , gestorven op 11 Januari 1882 te Keulen) is als de vierde zoon van een kinderrijk gezin - hij had 12 broers en zusters- in Neuss geboren, waar zijn vader een boekhandel bezat. Na het bezoek aan de lagere school en het gymnasium in Neuss en Keulen studeerde hij medicijnen aan de universiteit in Bonn, Würstenburg en Berlijn. Nadat hij 5 jaar lang als assistent aan het anatomisch museum in Berlijn werkte kreeg hij in 1839 aan de universiteit van Löwen zijn eerste academische aanstelling. In 1848 ging hij over naar de Belgische universiteit in Luik, alwaar hij tot Professor in de anatomie benoemd werd. Daar werkte hij tot 1880. Schwann bleef ook na beëindiging van zijn ambt in Luik en bracht zijn vakantie alleen maar door bij zijn familie in Neuss, Keulen en Dusseldorf. Na zijn colleges aan de universiteit hield hij zich intensief bezig met het vraagstuk van de ademfysiologie en voerde een groot aantal richting aangevende experimenten uit. In 1837 vond hij langs experimentele weg het éénduidige bewijs voor het feit, dat gist een levend wezen is en dat de gisting zich voltrekt door zijn levensactiviteiten. Aan de Belgische academie van Wetenschappen in Brussel komt de verdienste toe van de eerste grote initiatieven op het gebied van de mijnbouw. ZIj organiseerde in het midden van de negentiende eeuw , na een vrij groot ongeluk in de Belgische mijnen een wetenschappelijke prijsvraag voor de constructie van een draagbaar en voor in de mijnen bruikbaar reddingstoestel. Schwann nam er deel aan in diende in 1853 een constructieontwerp in. Het werd een kringlooptoestel, door hem "Aerophor" genoemd; het eerste toestel met een gesloten systeem, d.w.z. met regeneratie en een voortdurend hergebruik van de inhoud der ademlucht, na vervanging van het in de longen verbruikte zuurstof mengsel. Het door Schwann uitgedachte principe is heden nog, althans in technisch verbeterde vorm, gangbaar. Schwann wilde allereerst belast door zware zuurstof tanks uit Bariumsuperoxide gelijktijdig kooldioxide binden en zuurstof ontwikkelen. Doordat het hem echter niet lukte de chemische reaktie krachtig genoeg te doen plaatsvinden, gebruikte hij voortaan een absorptiemiddel dat met het bijtende Calciumhydroxide als absorptiemiddel voor de kooldioxide doordrenkt was. De door het lichaam opgenomen zuurstof vulde hij aan door opname uit twee gedragen voorraadtanks die gevuld waren met zuurstof met 5 bar druk. Zoals uit vorige foto's duidelijk zichtbaar was, is de gedachte van het regeneratie principe door Schwann zeer goed opgelost. De beide voorraadtanks worden op de rug bevestigd: een manometer toont de druk. Tussen de beide tanks bevindt zich de regeneratietank ter absorptie van de kooldioxide. Op de borst wordt een zak van kautschuk bevestigd, die de taak van ademzak (contralong) heeft. In het mondstuk zijn twee éénweg ventielen aangebracht. De verbruikte lucht wordt door de kracht van de longen door het uitademventiel en de uitademingsslang naar de regeneratietank geleid. Deze is met de korrelachtige massa gevuld en bestaat uit verscheidene met elkaar verbonden compartiementen, en doorboorde metalen tussenschotten, waar de ademlucht doorheen stroomt. Die wordt aldaar van de kooldioxide gereinigd en komt dan weer in de ademzak. Van hieruit wordt ze via de inademslang en het inademventiel in het mondstuk weer ingeademd. De vereiste verse zuurstof wordt uit de verse voorraad tanks door middel van een fijn dosseerbaar ventiel naar behoefte geregeld. In deze regulator wordt de ventielconus met de hand zo ingesteld dat die zich pas sluit, wanneer in de voorkamer van de regeneratietank een druk van 1,25 bar heerst! Dientengevolge kan ongeveer 0,5 liter zuurstof per minuut vanzelf via het ventiel uit de voorraad tanks ontsnappen. Het toestel van Schwann zou voor ongeveer 60 minuten adembaar gas bieden. Het gewicht van unit bedraagt ongeveer 20 kilogram. Van dit toestel zijn slechts enkele testmodellen vervaardigd. Tot een seriematige productie en praktisch gebruik schijnt het niet gekomen te zijn. Helaas werd het vernuftige en zo waardevolle voorstel van Th. Schwann op grond van een betreurenswaardige omstandigheid pas in 1876 naar aanleiding van de "Brusselse hygiëne - tentoonstelling" van zijn archiefregels van de academie bevrijd en in 1877 in de " Revue universelles des Mines" uitvoeriger beschreven. De tot nu toe gebruikelijke constructies waren op de eerste plaats ontworpen voor giftige of onadembare atmosferen boven het wateroppervlak, zoals bijvoorbeeld inde mijnen of voor met rookgassen gevulde brandende huizen. In 1878 - dus pas 25 jaar na de fundamentele uitvinding van Th. Schwann - werd toen in Engeland een apparaat voor duikers bekend, dat door Henry A. Fleuss geconstrueerd werd en zowel voor gebruik onderwater als ook voor giftige atmosferen bestemd was. Het lijkt in principe gelijkwaardig hoewel in constructie niet gelijk. Fleuss maakt hier het eerste functionerende zuurstof-kringloop apparaat voor duikers. Uit deze eerste zuurstof kringloop toestellen ontstonden in verscheidende uitvoeringen en na verschillende ontwikkelings stappen onze huidige rebreathers. Zo kunnen we intussen terugkijken op een bijna 150 jarige ontwikkelingsgeschiedenis. 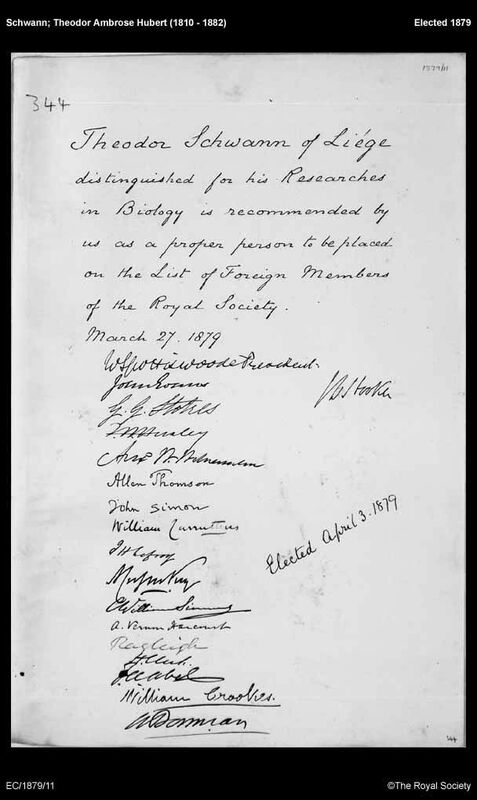 This is the document showing Professor Schwann was elected on 3 April 1879 as a foreign member of the Royal Society.